Starting on September 1, 1941, two years into the Battle of the Atlantic, U.S. war­ships began es­corting con­voys of Britain-bound mer­chant­men from the North Amer­i­can coast. Con­voys departed from New­found­land off the coast of Canada and ended in the mid-Atlan­tic at Ice­land. Four days after ini­ti­ating the es­cort ser­vice, the U.S. de­stroyer Greer, bound for Ice­land with a load of mail, was attached by a Ger­man sub 175 miles south­west of that island and, in responding to the attack, damaged it. 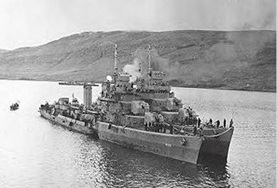 On this date in 1941 off the south­west coast of Iceland again, the Battle of the Atlan­tic escalated when a German U‑boat tor­pe­doed the U.S. de­stroyer Kearny as it came to the rescue of a Cana­dian-escorted convoy. Eleven U.S. crew­men were killed and twenty-two wounded. A Brit­ish de­stroyer was also sunk in the same attack. The attacker, U‑568, was a part of a wolf pack that had been harassing British and Cana­dian trans­atlantic con­voys for some time. The USS Kearny, which had been launched only the year before, was the second U.S. Navy ship since World War I to be fired on and hit. (The U.S. river gun­boat USS Panay, which served to pro­tect Amer­i­can interests on the Yangtze River in China, was sunk off the Chi­nese capi­tal of Nan­king by Japa­nese air­craft in mid-Decem­ber 1937 and may be con­sidered the first U.S. naval ca­su­alty of World War II.) Ten days after the Kearny attack, Presi­dent Franklin D. Roose­velt told Amer­i­cans that the coun­try would not take the in­ci­dent “lying down.” “Amer­ica has been attacked,” the presi­dent said, but he didn’t seek an imme­di­ate declara­tion of war; in­stead, he asked Con­gress for autho­ri­za­tion to arm Amer­i­can mer­chant ves­sels and allow them to enter com­bat zones, meas­ures for­bidden by U.S. Neu­trality Acts that the U.S. Con­gress had passed in 1937–1939. In early Novem­ber, after the old four-stacker USS Reuben James was tor­pe­doed off Ice­land on Octo­ber 31, 1941, sinking in minutes with a loss of 115 lives, including all of its offi­cers, Con­gress com­plied with the presi­dent’s request. The U.S. and Ger­many were now in­volved in an unof­ficial war at sea. And that’s where things stood between the two powers until Decem­ber 11, 1941, when Germany declared war on the United States as a ges­ture of solidarity with its Axis-treaty partner Japan. Left: The USS Reuben James—a four-funnel, post-World War I destroyer—was sunk by U-552 west of Iceland as she escorted an east­bound con­voy sailing from New­found­land. A tor­pedo hit the for­ward section of the Reuben James. When a maga­zine exploded it blew off the ship’s entire bow, which sank imme­di­ately; the aft section sank five minutes later. Of the 159-man crew, only 44 sur­vived. Counting the con­flict in China, the Reuben James was the second U.S. Navy ship sunk by hos­tile action in World War II. 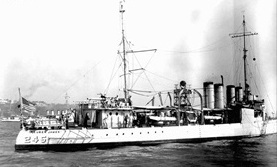 The river gunboat USS Panay, serving on the Yangtze Patrol in China, was bombed, strafed, and sunk by Japa­nese air­craft on Decem­ber 12, 1937, with a loss of 4 dead and 43 sailors and 5 civilians wounded.